Before you read this article, go to that drawer where you keep all the flash thumb drives that you’ve collected over the years – gather them up and throw them right into the garbage. Now that you’re back, go and get those thumb drives out of the garbage and make a plan to dispose of them in an environmentally responsible way. But still feel reassured that you no longer have to rely on those antiquated means of portable storage thanks to Samsung’s new Portable SSD T3. Sure, it’s bigger than the thumb drives you’ve relied on for years. If this new type of external drive ever becomes as ubiquitous as those, we might call it a “palm drive” because it fits perfectly into the palm of your hand. It’s about as thick as a pen, so sliding it into a pocket on your clothing or in any bag is easy. But the amount of storage offered up in such a compact package is incredible. Samsung offers 250 GB, 500 GB, 1 TB and 2 TB (!) models. All of them are the same size and weight. 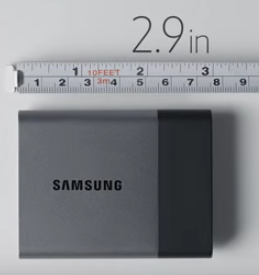 Samsung’s Portable SSD T3 drive easily fits into the palm of your hand. The drive works with Windows, OS X, and even Android operating systems. So you can use it to move files from your mobile device to your desktop system if you like. If you’re like me, that photos folder on your device is slowly eating up all your storage. Moving off the archive material can really free up some space for more apps (and new photos too). The best use of the Portable SSD T3 for me was as a video editing accessory. I kept the drive in my camera bag during my recent coverage of the SAS Global Forum in Las Vegas. When I was cutting together a video interview, my Mac complained about its hard drive getting full, so it rescued me from having to spend time figuring out what old stuff I should delete. I plugged it into the USB port and used it as a scratch disk in Final Cut while I was editing. Even though my MacBook doesn’t have USB 3.0, which supports the fastest speed of up to 450 MB/sec transfer on this drive, it still worked like a charm. I was impressed with its speed to throw around large files and never felt like I was waiting too long for a transfer. You also don’t have to worry too much about the drive clunking around in your backpack or briefcase, as Samsung says it is designed to survive a drop of up to two metres. If you’re using the drive to store sensitive data, Samsung offers onboard software that you can install to encrypt it with AES-256 bit level protection. That might help get this past your IT guy if you need it to be approved to use in your work environment. The cost of this product reflects its portability, speed, and convenience. Canadian prices on Amazon start at $116 for the 250 GB model and climbs to up to $550 for the 1 TB model. I couldn’t find any listings for the 2 TB model. Here’s hoping this type of product is indicative of a new trend in external storage drives that offer enough space to move more than a few photos or some text-based documents. An area of technology that’s still needed to complement all the cloud-based storage services we use.